The ONLY way to find out if your home has high Radon levels is to have your home tested. 50-60% of all homes tested in Rochester MN, and Olmsted and the surrounding counties exceed the EPA’s recommended action level of 4 pCi/L. Nationwide, 7% of homes are estimated to have high Radon levels. Levels can vary widely even from home to home in the same neighborhood. HomePro Home Inspections uses the latest in Radon Measurement technology. 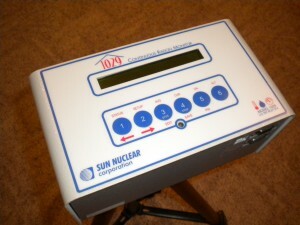 The Sun Nuclear 1029 continuous Radon Monitor provides accurate, continuous Radon Measurement for our clients. This unit is far superior to passive radon measurement devices and provides a high level of tamper proof features. Passive Radon measurement devices can be moved, windows can be opened, etc. during the Radon Measurement process. The NEW model 1029 Continuous Radon Monitor is even more impressive with environmental sensors checking temperature, barometric pressure and relative humidity to further assist with closed building conditions. It has twice the sensitivity as it’s predecessors and provides selectable interval settings to read as low as half an hour. A time and date clock will automatically record start/stop times and print along hourly intervals. A 12 hour delay start can be selected to meet all proficiency program closed building procedures. The monitor can be programmed to shut down when the test is complete. The software program allows “read only” time and date parameter’s to prevent tampering once the test is complete. Test site and weather conditions can also be added along with customer address and contact information. Add photo images of the monitor location in the home. PC software allows for downloading printing of complete report with all readings and graphs to better provide an accurate picture of the Radon readings during the measurement process. Older PostHome Inspector Asks, Is Your Air Conditioner Ready For Summer?